Hackers lit up the Green Building with a ribbon on Tuesday night, in honor of the 1-year anniversary of the Boston Marathon bombings and the death of MIT Officer Sean Collier. 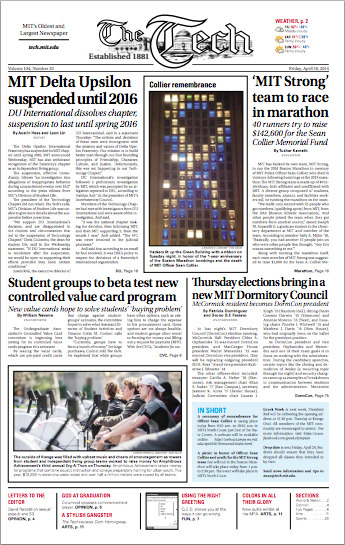 The Delta Upsilon International Fraternity has suspended its MIT chapter until spring 2016, MIT announced Wednesday. MIT has also withdrawn recognition of the fraternity’s chapter as an independent living group. MIT has backed its own team, MIT Strong, to run the 2014 Boston Marathon in memory of MIT Police Officer Sean Collier, who died in violence following bombings at the 2013 marathon.The MIT Strong team is made up of 40 individuals, both affiliated and unaffiliated with MIT. A diverse group composed of students, faculty members, alumni, and facilities workers will be running the marathon on the team. At last night’s MIT Dormitory Council (DormCon) election meeting, McCormick Hall President Chloe A. Orphanides ’15 was elected DormCon president, and MacGregor House president Walter Menendez ’15 was elected DormCon vice president. They will be replacing outgoing president Eli H. Ross ’14 and vice president Katherine J. Silvestre ’14.